11 October, 2012, 09:01 pm in "October 2012"
All summer long and into this fall Meijer has been undergoing a major store remodel. It looks fresh and different inside, which is almost finished; outside, the parking lot is being completely redone. 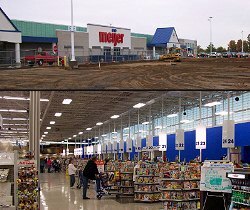 Meijer has just finalized the new grocery aisle layout; you can find this as well as a near-final store layout on the Meijer store map page. 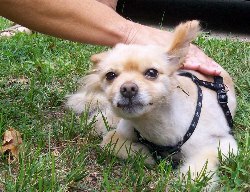 17 September, 2012, 01:23 pm in "September 2012"
Alert: Is this your dog, or do you know the owner? If so please call the Coldwater Police Department to give info. The dog was hit by a motorist around noon today on Grand St. near Pierce St. We thought he was a goner but apparently he was just knocked cold for a while. The motorist called the police who then took the dog away (presumably to an animal shelter / hospital). He got to ride in the front seat! The dog has a collar but no identification tag. 6 August, 2012, 09:51 pm in "August 2012"
Saturday afternoon was the Branch County Fair Parade which kicked off Fair Week which is August 5 - 11. 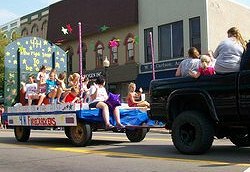 Over half an hour long, the parade not only featured fair-related floats, horses and tractors, but also a large number of political candidates hoping for your vote in tomorrow's Primary Election. Click here to view a photo album of the entire parade. 11 June, 2012, 02:01 pm in "June 2012"
8 June, 2012, 09:27 pm in "June 2012"
There's going to be some changes at the Super Liquor II strip mall (across the street from West Side Shell). 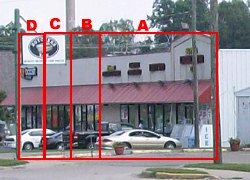 As of earlier this year, Super Liquor II occupies "A" in the photo at right, with Gypsy Tears Tattoo in "B" and Boost Mobile in "C" and "D". Gypsy Tears has now closed and moved to Kalamazoo. The owner of Super Liquor II seeks to expand into both "B" and "C". I confirmed today that Boost Mobile will definitely stay, though their store will shrink to half its current size (occupying only "D" instead of both "D" and "C").